Mercerized cottons have changed over the years and I've changed my mind about them too. Mercerized cotton yarns may have some advantages over non-mercerized, but I used to find knitting with them a fairly joyless experience. While these yarns have a lovely shine, deep colors, and don't pill much; I still didn't want to work with them. For starters, the finished fabric felt too crunchy, but the worst thing was how hard they were on my hands. The yarn felt abrasive as it passed through my fingers. Cotton is mercerized by immersing it in an alkaline solution. This chemically alters the structure of the fiber and makes it stronger, shinier and less likely to pill. It turns out that nowadays mercerized yarns are available that reduce the downsides. 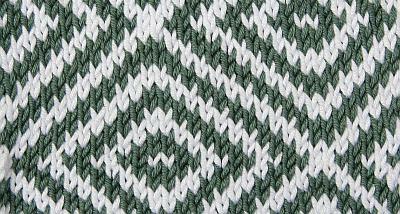 In the years since I last used mercerized cotton, yarns with an S-on-S ply have been introduced. This construction gives a small amount of elasticity to the yarn. There's nowhere near as much bounce as when something springy—like Merino—is S-on-S plied, but still enough to notice a difference. I found knitting with one of these more recent yarns a much nicer experience compared to the mercerized cottons that I've used before. I tried Rico Essentials Cotton DK, a mercerized, S-on-S ply yarn with silky smooth fibers that didn't hurt my hands as I was knitting and reduced the crunch in the finished fabric. 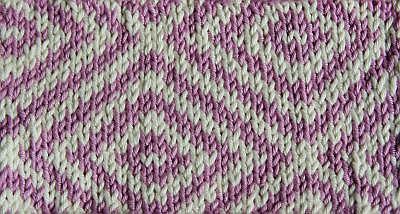 I even tried out a fair-isle swatch and I was surprised to find that the results were pretty good. Given the Rico's super-sleek appearance and lack of fuzziness, it's not what you might call an 'ideal' colorwork yarn. I'd expected it might look a bit of a mess! I am guessing that the little extra elasticity is helping. The Rico swatch had a flatter, less puckered finish than my comparison swatch, made in the traditionally-plied Rowan Cotton Glac�. I still prefer the slightly fuzzy, matte appearance of natural cotton, but I would now happily choose mercerized for a project where it makes sense. I might take advantage of its lack of pilling for an everyday summer cardigan that will be frequently slung into a bag as the weather changes. Or make use of its luster and drape with a sweater for evening wear. And of course its strength and shine have made it a long-time favorite for crochet. I've also realized that it's worth taking another look at other fibers as production methods change. I'm not keen on knitting with either viscose or acrylic for example, so I tend to avoid them even for projects where they might have clear advantages. Perhaps I need to think again with those fibers too. So, mercerized cotton is back on my agenda for Summer knitting, plus I'm going to see if I can find a super-soft, low-pilling, shine and squeak-free synthetic yarn. Let me know if you have any suggestions!